One of the most important writers and thinkers of the Renaissance, Michel de Montaigne (1533-92) helped invent a literary genre that seemed more modern than anything that had come before. But did he do it, as he suggests in his Essays, by retreating to his chateau and stoically detaching himself from his violent times? Philippe Desan overturns this long standing myth by showing that Montaigne was constantly connected to and concerned with realizing his political ambitions--and that the literary and philosophical character of the Essays largely depends on them. Desan shows how Montaigne conceived of each edition of the Essays as an indispensable prerequisite to the next stage of his public career. It was only after his political failure that Montaigne took refuge in literature, and even then it was his political experience that enabled him to find the right tone for his genre. 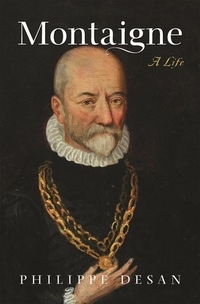 The most comprehensive and authoritative biography of Montaigne yet written, this sweeping narrative offers a fascinating new picture of his life and work.